10% OFF - Masada & The Dead Sea Day Tour! Masada & The Dead Sea Day Tour. Pass the Inn of the God Samaritan on the descent through the Judean Desert to the Dead Sea. Ascend Masada by cable car and see the remains of the Herodian fortress where the Zealots were overcome by the Romans in 73 CE. Enjoy the therapeutic benefits of a mud bath and a swim in the Dead Sea. Book and Get 10% OFF - Masada & The Dead Sea Day Tour. Take 10% OFF - Tour No 42, Caesarea, Haifa, Acre and Rosh Hanikra, One day tour departing from Tel aviv, Jerusalem and other locations. 10% OFF - Tour Nazareth, Tiberias and Sea of Galilee! Take 10% OFF - Tour No. 41 Nazareth, Tiberias and Sea of Galilee, departing from Jerusalem, Tel aviv and other pickup locations. Get 10% OFF - Jerusalem Old and New Tours!! Get 10% OFF - Jerusalem Old and New Tours!! Best selling daily tour to Jerusalem: Western Wall, Via Dolorosa, the Stations of the Cross,the Church of the Holy Sepulchre, Yad VaShem Holocaust Museum, and other major sites. Tour pick up from Jerusalem, Tel aviv. Take 10% OFF - Masada 1 Day Tour!! Take 10% OFF - Masada 1 Day Tour!! Mt. Masada and The Dead Sea day tour (Options: Dead sea SPA, Ein Gedi, Qumeran caves). Take 10% OFF - Jerusalem Day Tours!! Take 10% OFF - Jerusalem Day Tours!! 00 - Jerusalem Half Day , 10 - Jerusalem Old City, 11 - Tour Jerusalem - Old and New 12 - Jerusalem and Bethlehem 13 - Jerusalem and Dead Sea Tour. Take 10% OFF - Tour Caesarea, Haifa, Acre and Rosh Hanikra!! Take 10% OFF - Tour Caesarea, Haifa, Acre and Rosh Hanikra, One day tour departing from Tel aviv, Jerusalem and other locations. Jerusalem Tour - Take 10% Off!! Jerusalem Tour - Take 10% Off!! Jerusalem Old and New day tour, departing from Tel Aviv or Jerusalem. Tour Nazareth - Get 10% Off!! Tour Nazareth - Get 10% Off!! Tour Nazareth, Tiberias and Sea of Galilee, 1 day. With coupon code: NAZARETH1099. Tour Mount Masada and The Dead Sea - Take 10% Off!! Tour Mount Masada and The Dead Sea - Take 10% Off!! Best selling daily tour to Mount Masada and The Dead Sea, Departing from Jerusalem, Tel aviv, Nathanya, Herzelya. Get 10% OFF - Caesarea, Haifa, Acre and Rosh Hanikra, 1 Day Tour. Get 10% OFF - Best Selling Tour: Caesarea, Haifa, Acre and Rosh Hanikra, 1 day. Use coupon code: CAESAREA-ACRE1099. 10% OFF - Christmas Eve in Bethlehem Tour!! Get 10% OFF - Christmas Eve in Bethlehem Tour!! Use coupon code: CHRISTMAS-IN-BETHLEHEM at checkout. All Tours - Take 5% OFF!! 5% OFF All Tours in Israel from Beinharimtours.com. Use coupon code: ISRAELTOURS59914 at checkout. 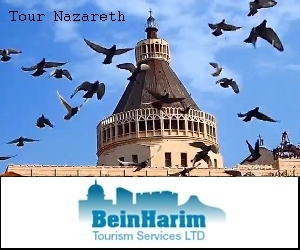 Bein Harim Tourism Services LTD is a leading Israeli government licensed travel service, specializing in the planning, organization and conducting of custom-made guided tours. Our company employs highly experienced government licensed tour guides. It offers tours in an extensive range of languages and all its vehicles are approved by this Ministry of Tourism to afford customers top comfort sightseeing.